Note: Last week, the McKinleyville Press marked its 15th anniversary. In celebration, Press Editor Jack Durham looks back on the newspaper’s history in a four-part series. This is the first installment. – Ed. McKINLEYVILLE – In the fall of 1995, I came home late one evening from a camping trip, turned on the evening news and learned that the Arcata Union was going out of business. Although I didn’t know it at the time, that was a pivotal moment in the birth of the McKinleyville Press. Upon hearing of the demise of the Union – where I worked as the News Editor – I didn’t think about starting a newspaper; I just worried about the prospect of unemployment. When I returned to work that Monday morning, I got some good news – at least good for me. After the final issue of the Union was printed, I would go to work as the Northern Humboldt County Bureau Chief for the Humboldt Beacon. Located in Fortuna, the Humboldt Beacon was the Union’s sister paper, owned by Patrick O’Dell, who also owned the Redwood Record in Garberville. O’Dell, a second-generation Fortuna business tycoon, had decided to close both the Union and the Redwood Record. The Humboldt Beacon would absorb all subscribers from both the Union and Redwood Record, transforming the Beacon from a Fortuna/Eel River Valley weekly to a county-wide publication. It was a bad idea, and doomed to failure, but I was happy to have a paycheck. The crew at the Union labored away on the final edition. It was a teary eyed experience putting a 109-year-old paper to bed forever. You couldn’t help but feel you were somehow letting down all the editors, pressmen and reporters who had poured their hearts and souls into the newspaper since 1886. The final Union hit the streets, and suddenly I was working for the Humboldt Beacon, happy to have a job, but disgruntled because all but one of my co-workers at the Union had lost their jobs, disgruntled because the closure of the Arcata Union had seemed unnecessary, disgruntled because the mission of the paper I was now working for was doomed to fail. Nevertheless, I continued to trudge off to work daily, spending three days a week gathering and writing news from my office in Arcata, and two days a week assembling pages in Fortuna. 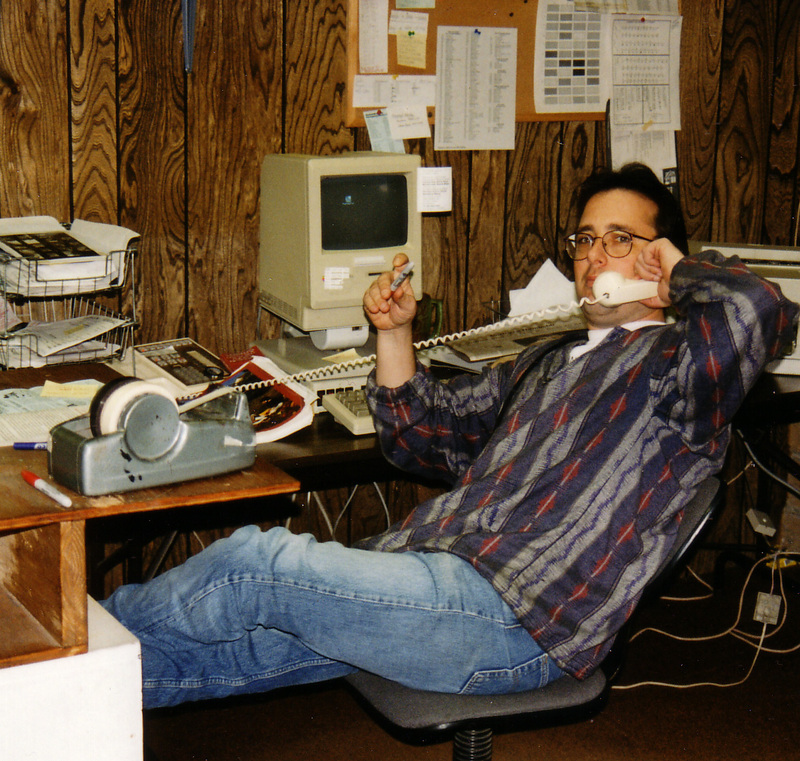 It was during this time that I began to seriously contemplate starting a small community newspaper in McKinleyville. The idea had simmered in my head for years, but it was always on the level of fantasy. It was never something I seriously thought I’d pursue. But with the closure of the Union, McKinleyville didn’t have a newspaper it could call its own. The Beacon didn’t fill that need, and never would. With one reporter (me), a freelance writer or two, and some columnists in charge of covering everything from Eureka to the Del Norte County line, the Beacon was stretched way too thin. It didn’t have any focus. From an editorial perspective, there was clearly a niche to fill in Mack Town. From a business perspective, the mid-1990s were a time of rapid growth in the bedroom community. More and more businesses were popping up on Central Avenue. There were potential advertisers. I began thinking about and researching what it would take to start a newspaper. I filled binders with notes and scribbles and lists. I gathered information on what computer programs I would need, where I could obtain newspaper racks, and so on. The process consumed me. Sometimes I’d wake up in the middle of the night, stare at the ceiling and mentally assemble the puzzle that would become the McKinleyville Press. At the start of the venture, my biggest advantage was my enthusiasm and starry-eyed optimism, But I had at least two things going against me: I didn’t have much money, and I didn’t know what I was doing. The money I had available to start the newspaper was less than $3,000 in cash. I also had credit cards – a dangerous way to finance an upstart enterprise. Lack of knowledge was the more serious hindrance. My newspaper experience was limited to reporting, editing, photography, and page layout on a computer. I had occasionally delivered newspapers as a kid and worked in the mail room during a short stint one summer at the Willits News. But I didn’t know anything about business, advertising, graphic design, paste up and a million other tasks involved in putting out a paper. Looking back, being ignorant and naive was probably beneficial at the start. Had I completely grasped what was involved in creating a paper, I probably would have scared myself out of the idea, and instead looked for a nine-to-five job with a steady paycheck. At some point in the spring of 1996 I decided, with my then-business partner, Sherilynn Silvernail, to create the McKinleyville Press. I continued to work at the Beacon as I began to assemble the pieces. First, I built a crude darkroom in my garage using old plywood that had previously been part of the Arcata Union darkroom before it was dismantled and tossed in a dumpster, where I salvaged it. I bought some used darkroom equipment for about $100. I bought my first computer – an Apple Performa 6200. With Pagemaker, Photoshop, a small scanner and a single laser printer, I was ready to go. The entire business occupied a single corner of my living room. There was a desk with a computer, printer and scanner. Nearby was a drafting table, a waxer and an Exacto knife for layout. I convinced Ethel Wilkins, who had written a column called “McKinleyville Matters” for the Union, to write for me. Ed Estes, a retired teacher and McKinleyville Community Services District boardmember, volunteered to cover sports at Mack High and write a political column. Tim Martin volunteered to write a column of varied topics. I was ready to roll. Although I had worked at newspapers, I had never actually put together an entire edition from scratch. I didn’t really grasp the enormity of the task. Had I known what I was getting into, I would have carefully prepared for the first issue of the McKinleyville Press. I would have mocked up most of the pages a week or two ahead of time, like Kevin Hoover did when he started the Arcata Eye nine weeks later. But that’s not what happened. I declared that within a week and a half, the first edition of the McKinleyville Press would come out. I bought some new clothes and hit the streets. There were stories to be written and ads to be sold. Keep in mind that while news articles get people to buy and read a newspaper, it’s advertising that pays most of the bills. So selling ads was, and is, of the utmost importance. Without advertising, there’s no newspaper. I walked in to Dalianes Travel, which had an office in McKinleyville back then, and asked Dianne Harris if she was interested in advertising. She said yes, and Dalianes became the newspaper’s first advertiser. Fifteen years later, Dalianes is still advertising. My next stop was Les Schwab Tires, which hadn’t opened yet. They were still putting the finishing touches on the new building. I met outside with manager Pat Sheehy. As I was giving Pat my sales pitch, a yellow Labrador walked up to me, sniffed my pants, lifted his leg and pissed on me! Despite standing there with my right pant leg covered in dog piss, I was ecstatic – Pat bought a full page ad, with color. But I wondered: How do I make a color page? The first deadline was a tough one. I had to develop film, make prints and scan them in. Every advertisement had to be made from scratch. There was a load of typing. There were stories to be written. Pages had to be created. We only had a single computer, so we weren’t able to share the page layout duties. After the pages were created on the computer, I had to print them all out on paper, cut them up, wax them and assemble the pages. The clock was ticking. I had to get the newspaper done by 7 a.m. that Monday so I could jump in the car and drive to Smith River in Del Norte County, where the paper was printed back then. I stayed up all night. At about 5 a.m. it occurred to me that there was no way I was going to meet my deadline if I started correcting all the typos. There simply wasn’t time. I haphazardly finished the pages, placed them in a plastic sleeve and literally ran out the door. I raced up to Smith River and arrived right on time. Adrenaline was rushing through my veins as I watched and listened to the first issue come off the Del Norte Triplicate’s Goss Community Press. That old press made a wonderful clickety-clackety sound. Since that day, one of my favorite things to listen to is a web press. It’s music to the ears. That afternoon, the paper was distributed for the first time, dropped in piles all over town. It was free for the first month. After that, we charged 35 cents an issue. Subscriptions were $12 a year. After delivering the paper, I came home, looked in the mirror and discovered that a single gray hair had sprouted on my head. I was 28 years old, and that was my first gray hair. More would follow. Next week: The McKinleyville Press grows, and life revolves around the weekly deadline. This entry was posted on Wednesday, July 27th, 2011 at 5:34 pm	and is filed under News, Opinion, Community, Business, Media. You can follow any responses to this entry through the RSS 2.0 feed.